Years ago, I remember designing websites that needed to work on WebTV, it was a real pain, the available screen real estate was/is around 544×372 pixels. The only person I knew that had one for testing was my neighbor, an elderly Czechoslovakian man that uses MSN TV to check online newspapers from his home country — he has the old WebTV branded box, but it’s really an original MSN TV (Microsoft bought WebTV many years ago). 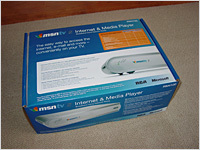 When I found out I would be getting a MSN TV 2 Internet & Media Player for review, I got a bit excited. Now, it wasn’t a XBOX 360 exciting moment (still waiting for that package to arrive — hint, hint), more of a nostalgic excitement. I wanted to see what Microsoft has done to make the original WebTV better. The MSN TV 2 is still targeted to the not so technical group of individuals, you know, the Grandma’s and/or Grandpa’s. When I saw the package, I was really hoping someone made a mistake and sent an XBOX 360 — that wasn’t the case. 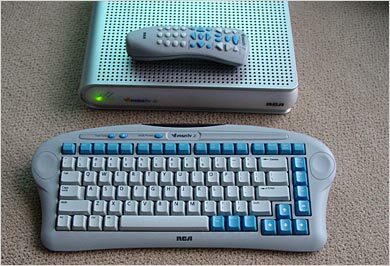 A RCA branded MSN TV 2 Internet & Media Player was pulled from the box. 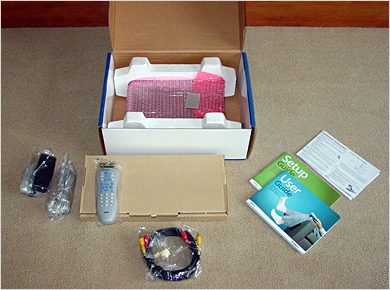 This package is all encompassing, it includes everything you need to hook up the MSN TV 2 to your TV and get you online. That includes all cables (video, audio and phone), even batteries, however, there is no ethernet cable — which will come in handy if you plan on connecting the MSN TV 2 via your broadband internet access and/or want to use the Media Player features of the device. Microsoft/RCA should have supplied that cable too. The device itself is average looking, but then again, this is aimed at a non-technical user, so it will surely be the best looking device near their TV. The included remote reminds me of the DVD player remote you can get with the regular XBOX, but in a blue, white color scheme. The keyboard is what I primarily used to navigate the MSN TV 2. It works great from different angles and is comfortable, however, the blue function keys have small white text on them that makes them a bit hard to read in low light settings. From the moment I took the MSN TV 2 Internet & Media Player out of the box, I was up and running within 10 mins — I expect this to be a bit harder for someone not familiar with plugging in a device like a DVD player, but the instructions were nicely done. I plugged the unit to a Philips 30″ HD Widescreen LCD panel via S-VHS (not supplied — only composite) and stereo RCA patch cables (supplied). The MSN TV 2 is a standard definition device, meaning it only outputs 480i. So I really recommend plugging the MSN TV 2 Internet & Media Player into a regular 27″ TV or a 480p (ED) display. The 480i output looks pretty crappy on a 30″ 1366×768 HD LCD, how bad? The text is borderline hard to read — this is also dependent on the quality of video processor your TV has. My Philips display was acceptable, but not something I’d want to spend hours reading blogs on. With the unit powered up for the first time, a series of easy to follow sign-up screens popped up. Once competed, I was ready to log-in. For my review, I set up the MSN TV 2 Internet & Media Player to use my 3Mbps DSL connection, instead of the dial-up connection. Dial-up is dead to me, but, if that is how you plan on using this device, be prepared for 56kbps speeds. – Middle — it’s a two column panel with a Local Weather/MSN Video rotating barker in the first column and a “News From MSNBC” in the second. I went to a bunch of sites and the MSN TV 2 could render them with no or minimal problems. Even ESPN.com — the internets most bloated website — loaded with usable results. The HTML rendering engine MSN TV 2 uses, can resize elements to fit in your TV screen, but I found myself preferring the option of turning that off, instead, loading the actual size with horizontal scrolling. The only real problems I encountered was with sites using Flash 7 or 8 content. Currently, the MSN TV 2 can display Flash content up to version 6. This is exactly what I expected the MSN TV 2 Internet & Media Player to be. There wasn’t any “shock and awe”, nor was I let down. This fits a particular market, great for someone or families that want an inexpensive, virus free device to check email, some IM’ing, and surf the web. The media player features are nice, but still too limiting in my opinion. I would have loved if it also was a Media Extender — it won’t playback Windows Media Center videos nor HD content (really no point due to the Standard Definition connectors). I would highly recommend this for an elderly person, it’s a no fuss, no headache system. They won’t need to worry about having firewalls and virus scanners and there is really no way to mess things up. My understanding is you can plug in USB printers and devices like cameras to view photos, but I think those are just bonus features that may never get used by the target user. Oh, and it’s worth mentioning that it has a photo screensaver — so you don’t have to worry about CRT burn-in on the old 27″ tv. I can see this platform be built into all HD displays, or my Windows Media Center, or my XBOX 360, or my Comcast 6412 DVR — all in HD of course! 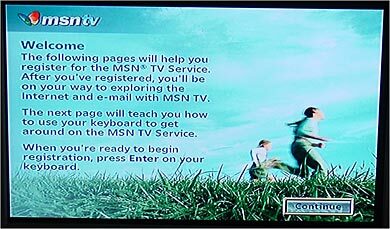 When I power up my display, MSN TV should be the first thing I see. It should have all my RSS feeds (BTW, MSN TV 2 has no built-in RSS support). If the device is not a Windows Media Center, then it should have full HD Media Center Extender (MCX) capabilities. I know what I’m asking for is not aimed at the intended demographic of the MSN TV 2, but they will be there, sooner than later — and I can see elements of MSN 2 useful to everyone! The MSN TV 2 Internet & Media Player is available now and the best deal I have found is from Amazon.com for $179.99 – $100 rebate = $79.99. With monthly service plans starting at $21.99/mo for dial-up and $9.95/mo for Broadband Service with your ISP. So if you’re still looking for a gift for Grandma or Grandpa, you might still have time to buy them the internet this Christmas.